On the set of "The Today Show" with Kathie Lee Gifford, Laura Bush, Jenna Bush Hager, and Aurora the African Penguin. Filming at The Turtle Back Zoo in West Orange, New Jersey with Aurora the African Penguin. Recently, I've been able to expand my reach by filming short Animals To The Max webisodes. The African Penguin, with less than 70,000 left in the wild, is endangered due to pollution, habitat loss, and over fishing. Aurora is part of a very important Species Survival Program, set in place by accredited zoos to insure the survival of her species. Me and "Quilliam" the North American Porcupine from The Turtle Back Zoo. Some animals like Quilliam here, get a bad rap for false accusations. Many believe porcupines have the ability to shoot quills; which is 100% false. The quills or modified hairs, are actually loosely attached to the skin and can come out quite easily if touched. Porcupines use their quills as a last resort. They'd rather warn their attackers by stomping their feet and making loud noises. My dressing room in The Tonight Show starring Jimmy Fallon and Megyn Kelly Today Studios. For the Olympics, Kathie Lee and Hoda were specially taping in Megyn Kelly's studio in front of a live studio audience. With the increased exposure, this was the perfect opportunity to highlight some incredible animals and conservation work being done. Pictured with Zeus and Athena and their handlers from the Binghamton Zoo. Meet Zeus and Athena, both pygmy goats from the Binghamton Zoo in Binghamton, New York. They both participate in Goat Yoga; a new national phenomenon where participants do yoga while goats run around, jump, and interact. The money raised goes back to support the Binghamton Zoo's green initiative. Actor Josh Lucas from the movie Sweet Home Alabama. You never know who you'll run into behind-the-scenes on The Today Show. This time around, it was actor Josh Lucas who was more than happy to take a picture with Aurora the penguin. When Aurora isn't busy educating the public and meeting celebrities, she lives with several other penguins at the Turtle Back Zoo. On a side note, Aurora actually prefers human company over penguins! 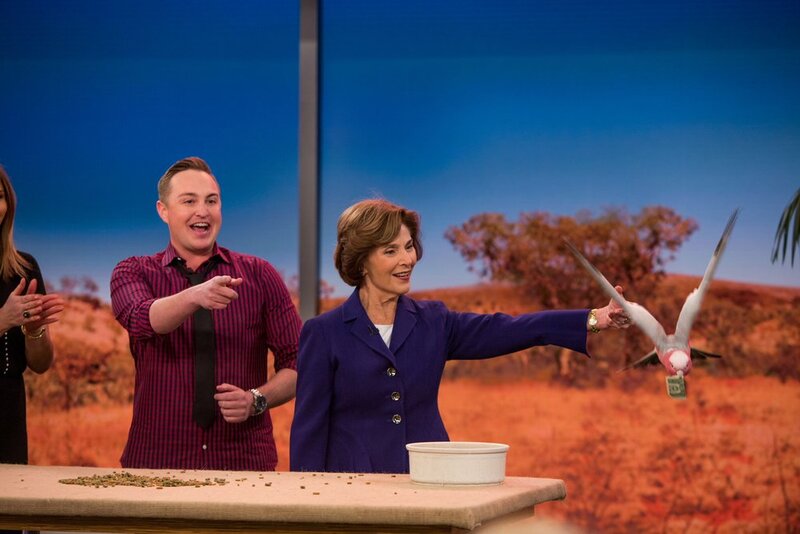 Former First Lady Laura Bush, Bird Trainer Phung Luu with a Rose-breasted Cockatoo, and Me. Former First Lady Laura Bush was a BIG surprise. My producer e-mailed me that morning and informed me there may be a chance Jenna's mom would help out during the segment. I was told to keep it hush, so you can imagine the surprise on everyone's face when she entered the room. She's a huge conservationist and a big animal fan. As you can imagine, this was a major plus! Jenna Bush asking me about goat yoga on the show. Trust me, I was just as shocked when I found out it was "a thing" too! A Rose-breasted Cockatoo flying to former First Lady Laura Bush. Phung Luu, from Animal Behavior and Conservation Connections, is arguably one of the best bird trainers in the world. Buffet, the Rose-breasted Cockatoo, is trained to take dollar bills from audience members during programs to raise money for his wild counterparts. I love everything about this part of the segment. The behavior shows the intelligence of the cockatoo while also having a strong conservation message. Quilliam the North American Porcupine checking out a camera on set. Photo Credit: Nathan Congleton, Today Show Photographer. ***Special thanks to the producers, Today staff, Kathie Lee Gifford, Jenna Bush Hager, special guest Laura Bush, the Turtle Back Zoo, Animal Behavior and Conservation Connections, and the Binghamton Zoo. If you missed the segment, check it out below! The newest member of our Animal Ambassador family, Topaz, a 15-year-old Blue-Tongued Skink. Recently, we welcomed a new animal to our ambassador team, Topaz, a Blue-Tongued Skink. He came from Seattle where his old owners rescued him from a household that did not know how to properly care for him. They fed him improper foods and did not keep his humidity levels correct (he's missing several toes because of this). Blue-Tongue Skinks are from Australia and are common occurrences in gardens, where they help out eating pests like insects. Meeting Oliver, a 45-day-old Milky-Eagle Owl from The World Center For Birds Of Prey in Boise, Idaho. Follow for more animal information and updates!